Look up physiatrists, rehabilitation medicine specialists, and those working within the physical medicine and rehabilitation departments and branches of numerous medical facilities. Pull a vast database of PM&R specialists and get in touch with this patient-focused group today! Do you want to talk to healing-focused doctors who frequently work with the disabled, injured, and elderly? Physical medicine and rehabilitation doctors aim to help raise the quality of life of patients who have physical impairments and disabilities. Physical and occupational therapists often fall under this wider umbrella, which is interested in the overall rehabilitation of patients. They work with those who have become paralyzed, who have had a stroke, and who have frequent lower back pain, as well as a host of other issues. These specialists use a vast array of tools and equipment to help their patients attain motion, cognitive function, and overall well-being. From specialty books to safe exercise equipment, PTs, OTs, and PM&R doctors need a lot of tools and help. If you have a piece of medical equipment, occupational tool, exercise device, or other relevant product, tell them with the help of this accurate lead list. 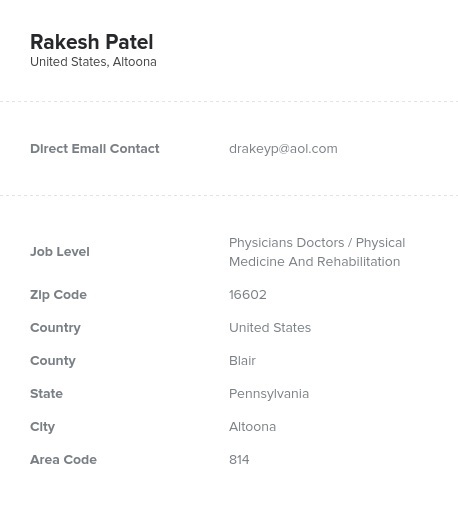 With Bookyourdata.com, you can find, email, write, call, and start connecting with physical medicine and rehabilitation specialists from many different hospitals and institutions. Share your product with them and help them serve their communities, patients, and assistants. Get the information you need organized into one resource, which is ready to download now!